July 28, 2014 By Tina M 5 Comments This post may contain affiliate links. Read my disclosure policy here. I hope everyone has been having the Best Summer Ever, as well as staying safe around the water and sun! I haven’t been blogging all the activities that I planned, I wanted to post this one that I did with my daughters using plastic bugs! When doing activities in the sun, remember to apply sunscreen as needed and even wear a hat! Dig. 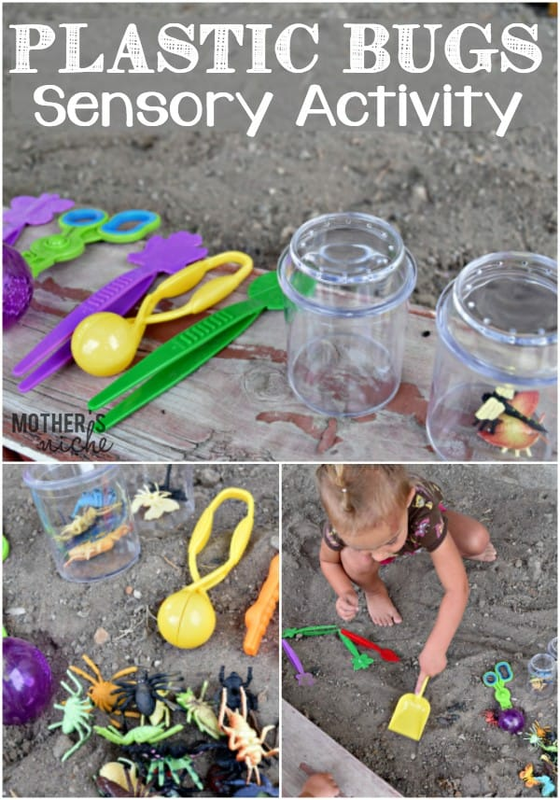 Bury the bugs in sand or dirt (or a sensory bin if doing indoors), and let your child try to find them! Be sure to count them so that they know how many to dig for! Pick Up. 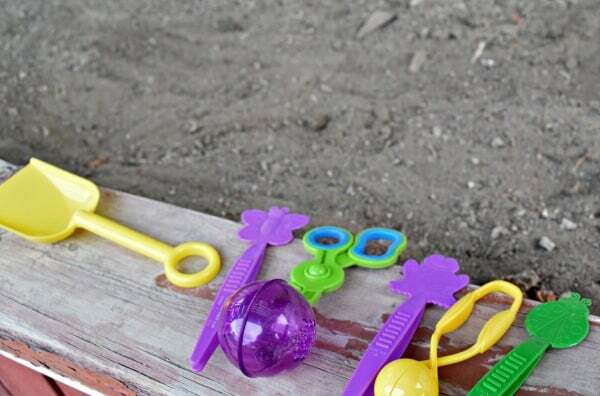 Activities that help with fine motor skills are great for toddlers! We alternated using the fine motor tool set and the science tongs, to help her with different finger movements and skills. Some were easier than others, so this is a great activity to do with kids of different ages. Wash. If desired, you can have a little “washing” bucket for getting hands wet and having fun washing all the dirt/sand off of the bugs. We skipped this step since we had already played with water, and bedtime was quickly approaching. Sort and Store. 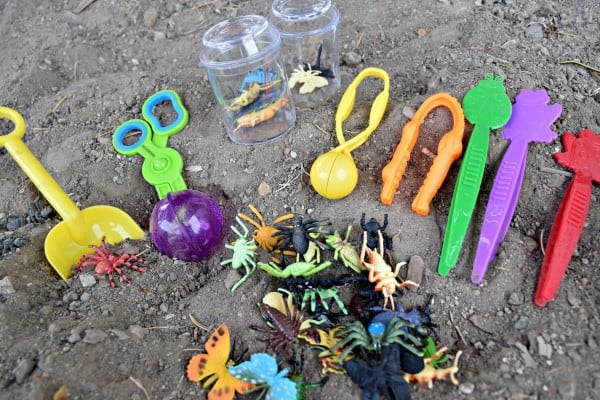 You can then have your child place the bugs in the bug jars, or sort them by color or size. Busy Bag. We also used these plastic bugs for a busy bag activity! My 2-year old and 1-year old have both loved taking along a bug jar to church. I was amazed at how my 1-year old was entertained! She kept taking the bugs out, putting them back in, and putting the jar lid on and off! She did this repeatedly for at least 20 min (2 weeks in a row). For older kids you could have them sort them, or even identify colors! Not only is it important to protect the kids, but my husband gets burned SUPER easy when he is outside. Most recently he has had the chance to use the new Banana Boat® Sport Performance® Clear UltraMist® Sunscreen with Powerstay TechnologyTM, specifically designed for the sport enthusiast and active individual who doesn’t want to be slowed down while out in the sun. This particular sunscreen is available in SPF 15, 30, 50+ and 100. Want to end the summer off with a bang?! How about the chance to win The Best Summer Ever sweepstakes, which gives families a chance to win summer fun prizes, including the grand prize – a family trip to a Treehouse Resort. Find out more on the Banana Boat Facebook page. This looks fun. I bet my little man would love it. Bugs, tools, and dirt. Everything a little boy loves. 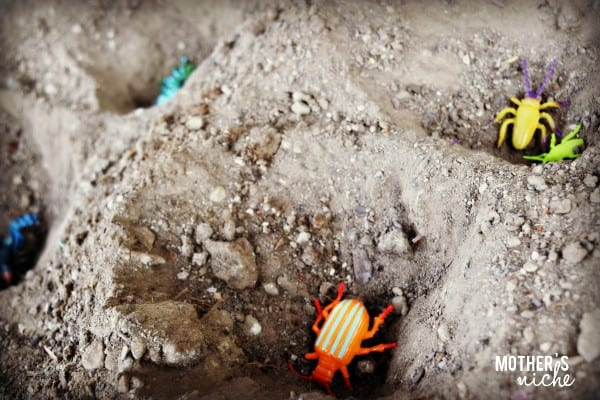 My kids would absolutely love diggin in the dirt for bugs! Fun idea! Is the fine motor tool set no longer available?